* Movement looks like new. * Dial needs to be cleaned. * Inside back is stamped New York. Nice. Thanks for the fast reply. I was not aware that the shield over the case detaches. I found this in a thrift shop. :-) What might you suggest I do about having a better dial. Can it be cleaned and also is the crystal sapphire? Thanks very much. Welcome to myBulova! Great looking watch in nice condition, what a great find! Really love the band. Although it is small enough to be a ladies watch now it is actually a mens model. You could have the dial refinished but it doesn't look too bad in my opinion. Thanks for the information on Douglas Corrigan. 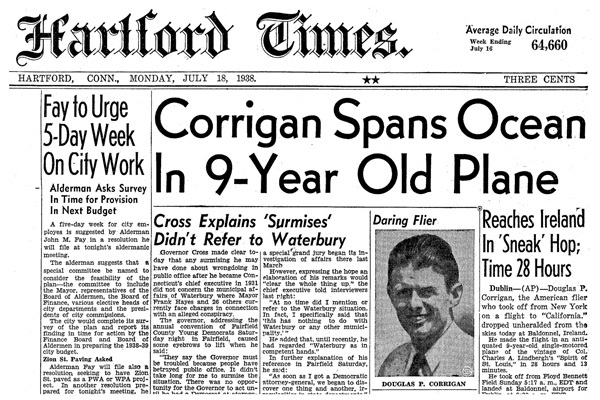 I must admit, before finding mybulova.com I was completely unaware of the Corrigan story. What a heroic feat. One of the most iconic examples of Art Deco watches, IMHO. This is one of the more collectible Bulovas, and those swivel lug extenders are like hen's teeth. I haven't seen one on a metal bracelet before, but the deco motif continues on the links, so this is a rare original bird indeed. The crystal will not be sapphire, usually glass or 'unbreakable' acrylic. It is possible to re-do the dial, but yours doesn't look that bad, and unless the dial is re-done precisely it will affect the value. A good original dial is still what collectors are after. I recommend taking it to watchmaker for any and all service, they will also be able to advise regarding cosmetic procedures like re-dials. Thanks so much for all your helpful information. Yes, the crystal is near perfect with no scratches, I won't replace it. I think it is acrylic. I guess I will keep the dial as is too rather than risk damage. I hadn't seen the metal bracelet on the other Corrigans so I thought it would be good to show the entire bracelet. Glad you appreciated seeing it. A question . . . .
Is it possible to add an additional photo - the movement. I haven't figured out a way to do it.